CrossReach is one of the largest social care agencies in Scotland, providing care and support for thousands of people in need every day of the year. Its services are available to people of all faiths or none at all. 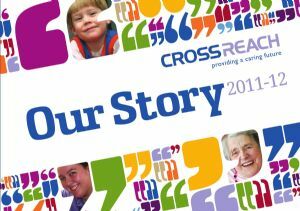 CrossReach was launched in June 2005 and was previously known as the Church of Scotland Board of Social Responsibility. Under the new name, CrossReach continues the Church of Scotland's long tradition of providing care and support. The organisation employs more than 2,000 staff in 80 services stretching from Shetland to the Scottish Borders. The care and support services help thousands of people in need every day of the year. CrossReach has an annual expenditure of over £50 million, of which less than 1% comes directly from the Church of Scotland. Most of the funding comes from local authorities, but the organisation also relies on donations and legacies to help continue vital work. Simpson House is based in central Edinburgh and is one of the many locations across Scotland from which the work of CrossReach is provided.